Today, disabled college students have many different types of accommodations—or modifications—available to make their studies easier: books in Braille or on CD, note takers, extra time on exams, among others. 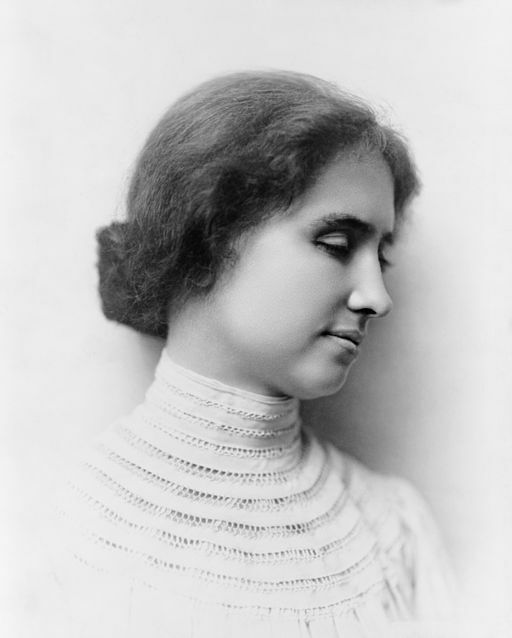 But when Helen Keller began attending college in 1900, none of these options were available. 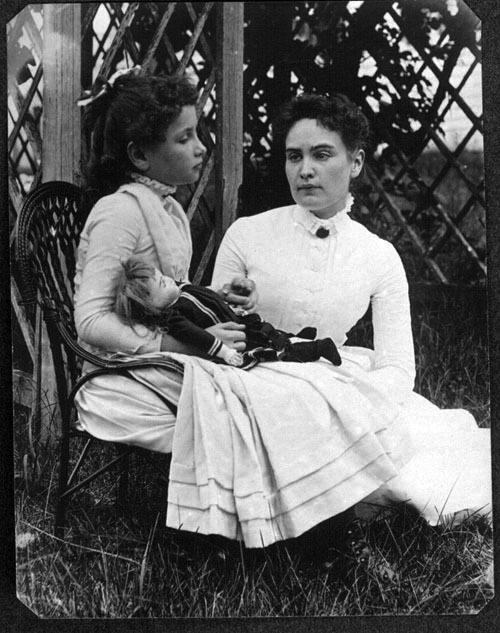 Under duress, Radcliffe College made a few crucial accommodations for Keller: Anne Sullivan was permitted to interpret Helen Keller’s classes for her, and Keller could use a typewriter for her assignments and exams. Sullivan also did not press for additional modifications; she felt that the public would question Keller’s achievement if Radcliffe made special provisions for Keller. Otherwise Keller and Sullivan were on their own. They found it tough going. Sullivan had to interpret lectures for Keller, then read the textbooks to Keller. As a result, Keller spent far more time on her studies than her counterparts. Keller also continued to advocate for blind and deaf people throughout her college years. As Keller explains, she did not have the typical college experience. THE struggle for admission to college was ended, and I could now enter Radcliffe whenever I pleased. Before I took this step, however, it was thought best that I should study another year under Mr. Keith. It was not, therefore, until the fall of 1900 that my dream of going to college was realized. I remember my first day at Radcliffe. It was a day full of interest for me. I had looked forward to it for years. A potent force within me stronger than the persuasion of my friends, stronger even than the pleadings of my heart, had impelled me to try my strength by the standards of those who see and hear. I knew that there were obstacles in the way, but I was eager to overcome them. I had taken to heart the words of the wise Roman who said, “To be banished from Rome is but to live outside of Rome.” Debarred from the great highways of knowledge, I was compelled to make the journey across country by unfrequented roads; and I knew that in college there were many bypaths where I should touch hands with girls who were thinking, loving and struggling like myself. I began my studies with eagerness. Before me I saw a new world opening in beauty and light, and I felt within me the capacity to know all things. In the wonderland of Mind I should be as free as another. Its people, scenery, joys, tragedies should be living, tangible interpreters of the actual world. The lecture-halls seemed filled with the spirit of the great and the wise, and I thought the professors were the embodiments of wisdom. If I have since learned differently I am not going to tell. I SOON discovered that college was not quite the romantic lyceum I had imagined it. Many of the dreams that had delighted my young inexperience became beautifully less and “faded into the light of common day.” Gradually I began to find that there were disadvantages in going to college. The one I felt, and still feel, most is lack of time. I used to have time to think, to reflect, my mind and I. We would sit together of an evening and listen to the inner melodies of the spirit, which one hears only in leisure moments when the words of some loved poet touch a deep, sweet chord in the soul that until then had been silent. But in college there is no time to commune with one’s thoughts. One goes to college to learn, it seems, not to think. When one enters the portals of learning one leaves the dearest pleasures — solitude, books and imagination — outside. I suppose I ought to find some comfort in the thought that I am laying up treasures for future enjoyment, but I am improvident enough to prefer present joy to hoarding riches against a rainy day. I AM frequently asked how I circumvent the peculiar conditions under which I must work in college. In the classroom I am, of course, practically alone. The professor is as remote as if he were speaking through a telephone. The lectures are spelled into my hand as rapidly as possible, and much of the individuality of the lecturer is lost to me in the effort to keep in the race. The words rush through my hand like hounds in pursuit of a hare which they often miss. But in this respect I do not think I am much worse off than the girls who take notes. If the mind is occupied with the mechanical processes of hearing and putting words on paper at lightning speed, I should not think one could pay much attention to the subject under consideration. I cannot make notes during the lectures because my hands are busy listening; but usually I jot down what I can remember of them when I get home. I write the exercises, daily themes, criticisms and hour-tests, the mid-year and final examinations, on my typewriter, so that the professors have no difficulty in finding out how little I know. When I began the study of Latin Prosody this year I devised and explained to my professor a system of signs indicating the different metres and quantities. Very few of the books required in the various courses are printed for the blind, and I am obliged to have them spelled into my hand. Consequently I need more time to prepare my lessons than other girls. The manual part takes longer, and I have perplexities which they have not. There are days when the close attention I must give to details chafes my spirit, and the thought that I must spend hours reading a few chapters, while in the world without other girls are laughing and singing and dancing, makes me rebellious; but soon I recover my natural buoyancy and laugh the discontent out of my heart. For, after all, every one who wishes to gain true knowledge must climb the Hill Difficulty alone, and since there is no royal road to the summit I must zigzag it in my own way. I slip back many times, I fall, I stand still, I run against the edge of hidden obstacles, I lose my temper and find it again and keep it better, I trudge on, I gain a little, I feel encouraged, I get more eager and climb higher and begin to see the widening horizon. Every struggle is a victory. One more effort and I reach the luminous cloud, the blue depths of the sky, the uplands of my desire. BUT college is not the universal Athens I thought it was. There one does not meet the great and the wise face to face; one does not even feel their living touch. They are there, it is true; but they seem mummified. We must extract them from the crannied wall of learning and dissect and analyze them before we can be sure that we have a Shakespeare and an Isaiah, or only a clever imitation. Scholars forget, it seems to me, that our enjoyment of the great works of literature depends more upon the depth of our sympathy than upon our understanding. The trouble is that very few of their laborious explanations stick in the memory. The mind drops them as a branch drops its overripe fruit. It is possible to know a flower, root and stem and all, and all the processes of growth, and yet to have no appreciation of the flower fresh bathed in heaven’s dew. Again and again I ask impatiently, “Why concern myself with these explanations?” They fly hither and thither in the heaven of my thought like blind birds beating the air with ineffectual wings. There are times when I long to sweep away half the things I am expected to learn; for the overtaxed mind cannot enjoy the treasure it has secured at the greatest cost. It is impossible, I think, to read in one day four or five different books in different languages and treating of widely different subjects and not lose sight of the very ends for which one reads — mental stimulus and enrichment. When one reads hurriedly and nervously, having in mind written tests, one’s brain becomes encumbered with a lot of choice bric-Ã -brac for which there is very little use. At the present moment my mind is so full of heterogeneous matter that I almost despair of ever being able to put it in order. Whenever I enter the region that was the kingdom of my mind I feel like the proverbial bull in the china-shop. A thousand odds and ends of knowledge come crashing about my head, and when I try to escape them, theme-goblins and college nixies of all sorts pursue me, until I wish — oh, may I be forgiven! — that I might smash the idols I came to worship. THE examinations are the chief bugbears of my college life. Although I have faced them many times and cast them down and made them bite the dust, yet they rise again and menace me with pale looks, until, like Bob Acres, I feel my courage oozing out at my finger-ends. The days before these ordeals take place are spent in cramming your mind with mystic formulÃ¦ and indigestible dates — unpalatable diets — until you wish that books and science and you were buried in the depths of the sea. At last the dreaded hour arrives, and you are a favored being indeed if you feel prepared and are able at the right time to call to your standard thoughts that will aid you in that supreme effort. It happens too often, however, that your trumpet-call is unheeded. It is most perplexing and exasperating that, just at the moment when you most need your memory and a nice sense of discrimination, these faculties take to themselves wings and fly away. The facts you have garnered with such infinite trouble invariably fail you at a pinch. “Give a brief account of Huss and his work.” Huss? Who was he, and what did he do? The name looks strangely familiar. You ransack your budget of historic facts much as you would hunt for a bit of silk in a rag-bag. You are sure it is somewhere in your mind near the top — you saw it there the other day when you were looking up the beginnings of the Reformation. But where is it now? You fish out all manner of odds and ends of knowledge — revolutions, schisms, massacres, systems of government; but Huss — where is he? You are amazed at all the things you know which are not on the examination paper. In desperation you seize the budget and dump everything out, and there in a corner is your man, serenely brooding on his own private thought, unconscious of the catastrophe which he has brought upon you! Just then the proctor informs you that the time is up. With a feeling of intense disgust you kick the mass of rubbish into a corner and go home, your head full of revolutionary schemes to abolish the divine right of professors to ask questions without the consent of the questioned. Thus my ideas of college have changed a good deal since I entered Radcliffe. While my college days were still in the future they were encircled with a halo of romance which they have lost; but in the transition from the romantic to the actual I have learned many things I should never have known had I not tried the experiment. One of them is the precious science of patience, which teaches us that we should take our education as we would take a walk in the country, leisurely, our minds hospitably open to impressions of every sort. Such knowledge floods the soul unseen with a soundless tidal wave of deepening thought. Some one has said, “Knowledge is power.” I say knowledge is happiness, because to have knowledge, broad, deep knowledge, is to know true ends from false and lofty things from low. To know the thoughts and deeds that have marked man’s progress is to feel the great heart-throbs of humanity through the centuries; and if one does not feel in these pulsations a heavenward striving, one must indeed be deaf to the wonderful harmonies of life. IN SKETCHING the events of my life I have shown how much I have depended on books not only for pleasure and for the wisdom which they bring to everybody who reads, but also for that knowledge of the world which comes to others through their eyes and their ears. Hardly a paragraph that I have written is without some reference to what I was reading. Books have meant so much more in my life than in the lives of others that I shall speak of my reading at some length, even though it takes me back again to the early years, the story of which I have already told. I read my first connected story in May, I887, when I was seven years old, and from that day to this I have devoured everything in the shape of a printed page that has come within the reach of my hungry finger-tips. As I have said, I did not study regularly during the early years of my education; nor did I read according to rule. At first I had only a few books in raised print — “Readers” for beginners, a collection of stories for children, and a book about the earth called “Our World.” I think that was all; but I read them over and over, until the words were so worn and pressed I could scarcely make them out. Sometimes my teacher would read to me, spelling into my hand little stories and poems that she knew I should understand; but I preferred reading myself to being read to, because I liked to read again and again the things that pleased me. It was during my first visit to Boston that I really began to read in good earnest. I was permitted to spend part of each day in the Institution library, and to wander from bookcase to bookcase and read whatever my fingers lighted upon. And read I did, whether I understood one word in ten or two words on a page! The words themselves fascinated me; but I took no conscious account of what I read. My mind must, however, have been very impressionable at that period, for it retained many words and whole sentences to the meaning of which I had not the faintest clew; and afterward, when I began to talk and write, these words and sentences would flash out quite naturally, so that my friends wondered at the richness of my vocabulary. I must have read parts of many books (in those early days I think I never read any one book through) and a great deal of poetry in this uncomprehending way until I discovered “Little Lord Fauntleroy,” which was the first book of any consequence I read understandingly. When she returned, almost the first thing we did was to begin the story of “Little Lord Fauntleroy.” I recall distinctly the time and the place where we read the first chapters of that fascinating child’s story. It was a warm afternoon in August. We were sitting together in a hammock which swung from two solemn pines at a short distance from the house. We had hurried through the dishwashing after luncheon in order that we might have as long an afternoon as possible for the story. As we hastened through the long grass toward the hammock, the grasshoppers swarmed about us and fastened themselves on our clothes, and I remember that my teacher insisted upon picking them all off before we sat down, which seemed to me an unnecessary waste of time. The hammock was covered with pine-needles, for it had not been used while my teacher was away. The warm sun shone on the pine trees and drew out all their balmy fragrance. The air was delicious, with a tang of the sea in it. Before we began the story Miss Sullivan explained to me the things that she knew I should not understand, and as we read on she explained the unfamiliar words. At first there were many words I did not know, and the reading was constantly interrupted; but as soon as I thoroughly comprehended the situation I became too eagerly absorbed in the story to notice mere words, and I am afraid I listened impatiently to the explanations that Miss Sullivan felt to be necessary. When her fingers were too tired to spell another word I had for the first time a keen sense of my deprivations. I took the book in my hands and tried to feel the letters with an intensity of longing that I can never forget. Afterward this story was embossed, and I read it again and again until I almost knew it by heart; and all through my childhood “Little Lord Fauntleroy” was my sweet and gentle companion. I have ventured to give the details connected with the reading of this story at the risk of being tedious, because they are in such vivid contrast to my vague, mutable and confused memories of earlier reading. FROM “Little Lord Fauntleroy” I date the beginning of my true interest in books. During the next two years I read many books at my home and on my visits to Boston. I cannot remember what they all were, or in what order I read them; but I know that among them were “Greek Heroes,” La Fontaine’s “Fables,” Hawthorne’s “Wonder-Book,” “Bible Stories,” Lamb’s “Tales from Shakespeare,” “A Child’s History of England,” by Dickens, “The Arabian Nights,” “The Swiss Family Robinson,” “Pilgrim’s Progress,” “Robinson Crusoe,” “Little Women,” and “Heidi,” a beautiful little story which I afterward read in German. I read them in the intervals between study and play with an ever-deepening sense of pleasure. I did not study nor analyze them — I did not know whether they were well written or not; I never thought about style or authorship. They laid their rich treasures at my feet, and I accepted them, as we accept the sunshine and the love of our friends. I loved “Little Women” because it gave me a sense of kinship with girls and boys who could see and hear. Circumscribed as my life was in so many ways, I had to look between the covers of books for news of the world that lay outside my own. Then, again, La Fontaine seldom, if ever, appeals to our higher moral sense. The highest chords he strikes are those of reason and self-love. Through all the “Fables” runs the thought that man’s morality springs wholly from self-love, and that if that self-love is directed and restrained by reason, happiness must follow as surely as the day follows the night. Now, so far as I can judge, self-love is the root of all evil; but, of course, I may be wrong, for La Fontaine had greater opportunities of observing men than I am likely ever to have. I do not object so much to the cynical and satirical fables as to those in which momentous truths are taught by monkeys and foxes. But I love “The Jungle-Book” and “Wild Animals I Have Known.” I feel a genuine interest in the animals themselves because they are real animals and not caricatures of men. One sympathizes with their loves and hatreds, laughs over their comedies, and weeps over their tragedies. And if they point a moral it is so subtle that we are not conscious of it. It was the “Iliad” that made Greece my Paradise. I was familiar with the story of Troy before I read it in the original, and consequently I had little difficulty in making the Greek words surrender their treasures after I had passed the border-land of grammar. Great poetry, whether written in Greek or in English, needs no other interpreter than a responsive heart. Would that the host of those who make the great works of the poets odious by their analyses, impositions and laborious comments might learn this simple truth! It is not necessary that one should be able to define every word and give its principal parts and its grammatical position in the sentence in order to understand and appreciate a fine poem. I know my learned professors have found greater riches in the “Iliad” than I shall ever find; but I am not avaricious. I am content that others should be wiser than I. But with all their wide and comprehensive knowledge they cannot measure their enjoyment of that splendid epic, nor can I. When I read the finest passages of the “Iliad” I am conscious of a soul-sense that lifts me above the narrow, cramping circumstances of my life. My physical limitations are forgotten — my world lies upward; the length and the breadth and the sweep of the heavens are mine! MY ADMIRATION for the “Ã†neid” is less justifiable, perhaps, but none the less real. I read it as much as possible without the help of notes or dictionary, and I always liked to translate the episodes that pleased me especially. The word-painting of Virgil is wonderful sometimes; but his gods and men move through the scenes of passion and strife and pity and love like the graceful figures in an Elizabethan masque, whereas in the “Iliad” they give three leaps and go on singing. Virgil is serene and lovely, like a marble Venus in the moonlight; Homer is a beautiful animated youth in the full sunlight with the wind in his hair. How easy it is to fly on paper wings! From “Greek Heroes” to the “Iliad” was no day’s journey, nor was it altogether pleasant. One could have traveled around the world many times while I trudged my weary way through the labyrinthine mazes of grammars and dictionaries or fell into those dreadful pitfalls, called examinations, set by schools and colleges for the confusion of those who seek after knowledge. I suppose this sort of Pilgrim’s Progress was justified by the end; but it seemed interminable to me. BUT how shall I speak of the glories I have since discovered in the Bible? For years I have read it with an ever-broadening sense of joy and inspiration; and I love it as I love no other book. Still there is much in the Bible so hateful to every instinct of my being that I regret the necessity which has compelled me to read it through from beginning to end. I do not think that the knowledge which I have gained of its history and sources compensates me for the odious details it has forced upon my attention. For my part, I wish, with Mr. Howells, that the literature of the past might be purged of all that is ugly and noxious in it, although I should object as much as any one to having these great works weakened or falsified. The story of Ruth, too — how Oriental it is! Yet how different is the life of these simple country folk from that of the Persian capital! Ruth is so loyal and gentle-hearted, we cannot help loving her, as she stands with the reapers amid the waving corn. Her beautiful, unselfish spirit shines out like a bright star in the night of a dark, faithless and cruel age. Love like Ruth’s, love which can rise above conflicting creeds and deep-seated racial prejudices, is as rare now as it was then. I DO not remember a time since I have been capable of loving books that I have not loved Shakespeare. I cannot tell exactly when I began Lamb’s “Tales from Shakespeare”; but I know that I read them at first with a child’s understanding and a child’s wonder. “Macbeth” seems to have impressed me most. One reading was sufficient to stamp every detail upon my memory forever. For a long time the ghosts and witches pursued me even into Dreamland. I could see, absolutely see, the dagger, and Lady Macbeth’s little white hand — the dreadful stain was as real to me as to the grief-stricken Queen. I read “King Lear” about the same time, and I shall never forget the feeling of horror when I came to the scene in which Gloster’s eyes are put out. Anger seized me, my fingers refused to move, I sat rigid for one long moment, the blood throbbing in my temples, and all the hatred that a child can feel concentrated in my heart. I must have made the acquaintance both of Shylock and of Satan about the same time, for the two characters were for a long while closely associated in my mind. I remember that I was sorry for them. I felt vaguely that they could not be good even if they wished to, because no one seemed willing to give them a fair chance. There are moments when I feel that the Shylocks, the Judases, and even the Devil, are broken spokes in the great wheel of good which shall in due time be made whole. It seems strange that my first reading of Shakespeare should have left me so many unpleasant memories. The bright, fanciful plays — the ones I like best now — appear not to have impressed me at first, perhaps because they reflected the habitual sunshine and gayety of a child’s life. But there is nothing more capricious than the memory of a child: what it will hold, and what it will lose. I have since read Shakespeare’s plays many times and know parts of them by heart, but I cannot tell which of them I like best. My delight in them is as varied as my moods. The little songs and sonnets have a meaning for me as fresh and wonderful as the dramas. But, with all my love for Shakespeare, it is often weary work to read all the meanings into his lines which critics and commentators have given them. I used to try to remember their interpretations, but they discouraged and vexed me; so I made a compact with myself not to try any more. I know there are things in Shakespeare and in the world that I do not understand; but I do not want them explained. I am content to wait until I “grow up” to their meaning; it is so much pleasanter to see veil after veil lift gradually, revealing new realms of thought and beauty, than to rush upon the citadel of Knowledge, horse, foot and dragoon, and then weep with Alexander because there are no more worlds to conquer. NEXT to poetry I love history. I have read every historical work that I have been able to lay my hands on, from a catalogue of dry facts and dryer dates to Green’s impartial, picturesque “History of the English People”; from Freeman’s “History of Europe” to Emerton’s “Middle Ages.” But the first book that gave me any real sense of the value of history was Swinton’s “World’s History,” which I received on my thirteenth birthday. Though I believe it is no longer considered authentic, yet I have kept it ever since as one of my treasures. From it I learned how the races of men spread from land to land and built great cities; how a few great rulers, earthly Titans, put everything under their feet and with a decisive word opened the gates of happiness for millions and closed them upon millions more; how different nations pioneered in art and knowledge, and broke ground for the mightier growths of coming ages; how civilization underwent, as it were, the holocaust of a degenerate age, and rose again, like the Phoenix, among the nobler sons of the North; and how by liberty, tolerance and education the great and the wise have opened the way for the salvation of the whole world. In my college reading I have become somewhat familiar with French and German literature. Emerson says, “France is by natural contrast a kind of blackboard on which English character draws its own traits in chalk.” This is equally true of German character. Its sincerity, simplicity and vigor stand out most clearly when contrasted with the conventionality, elaborateness and mellifluousness of the French. The German puts strength before beauty, and truth before convention, both in life and in literature. There is a vehement, sledge-hammer vigor about everything that he does. When he speaks it is not to impress others, but because his heart would burst if he did not find an outlet for the thoughts that burn in his soul. But as symbols are sent. I think this is an idea not native to the French mind. Of all the French writers that I have read I like Moliere and Racine best. There are fine things in Balzac and passages in MÃ©rimÃ©e which strike one like a keen blast of sea-air. Alfred de Musset is impossible! I admire Victor Hugo — I appreciate his genius, his brilliancy, his romanticism; yet he is not one of my literary passions. But Goethe and Schiller are interpreters of eternal things, and my spirit reverently follows them into the regions where Beauty and Truth and Goodness are one. I am afraid I have written too much about my book-friends; yet I have mentioned only the authors I love most, and from this fact one might easily suppose that my circle of friends was limited and undemocratic — a sort of literary “Four Hundred” — which would be a very wrong impression. I LIKE many writers for many reasons — Carlyle, for his ruggedness and Hebraic scorn of shams; Wordsworth, “the bard of the river and the wood”; I find an exquisite pleasure in the oddities and surprises of Hood, in Herrick’s quaintness and the palpable scent of lily and rose in his verses; I like Whittier for his enthusiasms and moral rectitude. I love all writers whose minds, like Lowell’s, bubble up in the sunshine of optimism — fountains of joy and good-will, with occasionally a splash of anger and here and there a healing spray of sympathy and pity. I love Addison who “makes us laugh and leaves us good and happy.” I love Goldsmith for his sweetness. I love Mark Twain — who does not? The gods, too, loved him and put into his heart all manner of wisdom; then, fearing lest he should become a pessimist, they spanned his mind with a rainbow of love and faith. I like Scott for the freshness, dash and large honesty which make his novels so delightful. Source: Keller, Helen, “The Story of My Life Series: Part 5,” The Ladies’ Home Journal, August 1902. Disability History Museum, http://www.disabilitymuseum.org/dhm/lib/detail.html?id=2414&page=all. (May 2, 2014).